﻿ Best Price on Hotel Catamaran in La Bacadilla + Reviews! Located on an island in the River Dulce, Hotel Catamaran features a private marina, outdoor pool and tennis courts. It offers stunning views of the river and the surrounding rainforest. 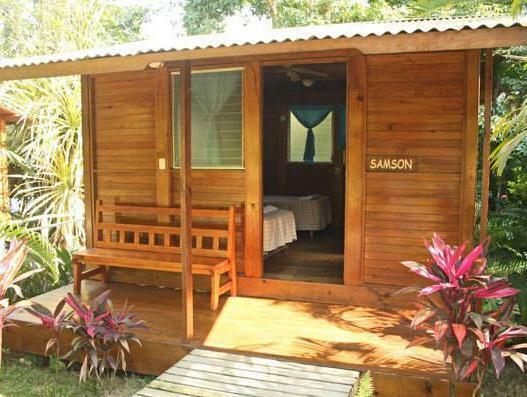 Accommodations at the Catamaran Hotel is in air-conditioned wooden bungalows with river views. All bungalows have private bathrooms with showers and free toiletries. Set over the water, the Catamaran’s restaurant serves Guatemalan and international cuisine, including soups, salads and fresh seafood. The bar specializes in piña coladas and margaritas. The hotel's tour desk can arrange canoeing and boat trips on the river. The 16th-century fortress of San Felipe de Lara is a 10-minute boat ride away, while Livingstone is a 45-minute boat ride away. Access to Hotel Catamaran is via boat from nearby Rio Dulce town. Boat transfers can be arranged directly in Rio Dulce. Please note that Hotel Catamaran is only accessible by boat. The boat transfer from Rio Dulce town to the hotel (5 min) is offered to guests both ways, as well as car parking. Please contact the property after you book for further details.